There were two reasons to visit 200-foot monolith column of black basalt rock known as Gilbert Hill. One – visitingÂ a rare and unique volcanic structure that was created 65 million years ago due toÂ moltenÂ lava that squeezed out of the earth’s clefts during the Mesozoic Era. And second reason to offer prayers at GaonDevi Durgamata temple that is there since 500 – 550 years and is swayambhu (self-manifested). Approx. 180 steep stairs one has to climb to reach the temple situated on top of Gilbert Hill. Upon query Shri Nagesh Shindi – the priest enhanced our knowledge about festivals days. Each year during Chaitra Purnima (April month) there is a big festival here at the temple venue and also in the month of December there is another festival to celebrated temple construction day. Half of Mumbai is seen from the top of the hill. And not to forget one of the best venue to watch Sunset. There is a small garden also on top of hill. 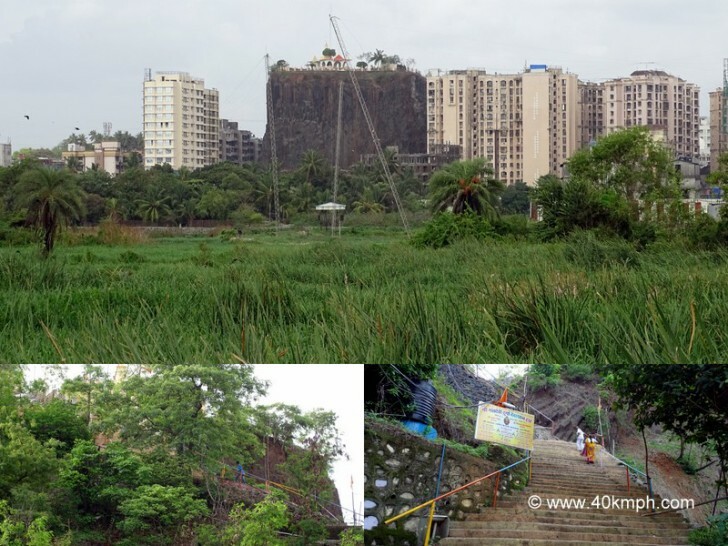 Swami Vivekanand road near Andheri Railway station is one of the best way to reach hill. There are two more rocks as similar as Gilbert Hill in the world. One is – Devils Tower National Monument in Wyoming, and the Devils Postpile National Monument in eastern California, USA. for more info check this video. Very interesting, never heard of it before. 200-foot monolith column of black basalt rock definitely sounds impressive!